Welcome back my fellow comic fans. In this installment I am once again headed into unknown territory for my review. I am going to be reading a book put out by Avatar Press. I have been aware of Avatar from the time I have spent working at my local comic shop. Mostly for being the publisher behind Crossed. But I came across a book released by Avatar that finally caught my interest. So let’s get going, shall we? Wolfskin is the tale of a viking-esque warrior, with no given name other than Wolfskin, who is ambushed in the wilderness by a group of bandits from a local village. After they attack him despite many warnings against it, he stands alone on the battlefield the only one alive. This one small event throws him into the middle of a turf war between two brothers over the fate of a village incapable of defending itself. Wolfskin doesn’t want anything to do with the turf war, and feels no regret for killing the men he killed, but he feels bad for the villagers who are trapped in the middle of the two brothers. While he doesn’t agree to defend the side of the war that he first meets, he doesn’t immediately tell them no. He agrees only to hear out the leader of the village while he decides where he will go next. Eventually he gets contacted by the other brother with offers of lots of money and as many women he could sleep with if he agrees to help him take over the whole village. Wolfskin starts to put together the true nature of the feud, and tells him that he better up his offers if he wants Wolfskin to help. After his run in with the “evil” brother he is once again approached by the brother who put him in this particular mess. It is during this meeting that he discovers what the man truly wants from him. Wolfskins are a special breed of berserker warriors who use mushrooms called black caps to put them into a blind fit of war rage. The man wants Wolfskin to use the mushrooms to wipe out the rival faction, which enrages Wolfskin. So neither side are honorable in their intent. After being betrayed by both sides Wolfskin is left dying of a poisonous arrow, forcing him to use the black caps. This turn reveals the reason for Wolfskins journey and his fear of using the power the mushrooms possess. Wolfskin is a rare version of the berserker warrior who goes into the rage and sees nobody for who they really are, therefore he slaughters any who cross his path. Also the effects of the mushrooms last much longer for him than for anyone else. But the black caps also allow him to heal faster and keep him from dying of the poison. Once he uses the black caps Wolfskin is brought before his deity Wrod. This conversation really flushes out the characters motivations for not wanting to take the mushrooms in the first place. And it also gives the reader a better understanding of why Wolfskin is where he is in his life. The ensuing battle is shown in gory detail as the two factions battle over the land. Then Wolfskin arrives in his battle rage and slaughters anything that moves. He shows mercy to none, just kills till no one is left to fight. The series ends with Wolfskin waking up from the effects of the black caps to see what he has wrought while in his rage. What he finds disturbs him to the point that he curses the gods and continue on his way vowing to never again serve their purpose. Warren Ellis does some pretty good writing on this series. He creates a character in Wolfskin that at first seems to be just a heartless killer who just wants to be left alone. But subtly develops into a character extremely torn about what he is and where he belongs. Ellis populates the world with a good variety characters that help to develop the character of Wolfskin. Juan Jose Ryp’s art is serviceable, but nothing to be really excited about. It is rough around the edges, but it makes the gritty feel of the world stand out at certain points of the story. All of the characters are easy to tell apart which is good when you are dealing with multiple characters interacting with each other. It also makes it easier to tell which of the brothers is trying to persuade Wolfskin to join their cause. Being a fan of Viking and barbarian style stories, this book was a fun read for me. I would have liked to see a different artist draw this, but that is my only real complaint about it. 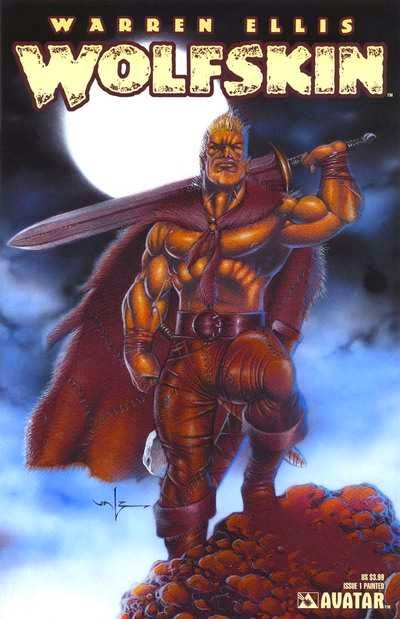 I did some research and found out there is an annual and a second series that continue the story of Wolfskin. If I were to come upon them while working at the shop I will probably pick them up and give them a read through. Thanks for reading this review. As always if you have any comments or suggestions feel free to leave them in the comments section. Until next time, I hope you enjoy your own adventure in the great world of comics.